The Strategic Master Plan and Development Guidelines provides the physical framework for renewal and development. 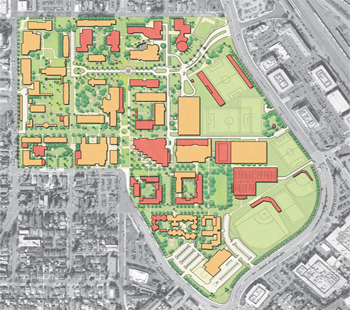 The document addresses campus planning goals and design guidelines for buildings and campus open spaces to strengthen the physical character of the campus and, in turn, support the quality of life at the university and in the surrounding community. 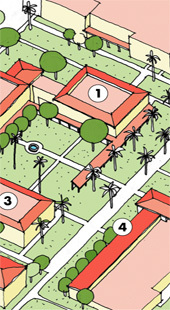 The university’s history is visible by the older buildings and the Mission Gardens. The campus has expanded significantly over time, leading to challenges such as street closures, new facilities, and building reuse. The university’s strategic goal is to maintain existing enrollment at 4,500 undergraduates and 3,750 graduate students, and to provide on-campus housing for 75 percent of undergraduate students.